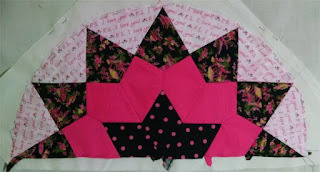 I've started a new hand-pieced project, Esther Aliu's "Stashing Busting Stars". You can read about the first half-star I made here. I thought that I would proceed on a 'one star a week' basis. After all, once the fabric pieces have been cut out, all you have to do is wrap them around the templates and sew them up, right? 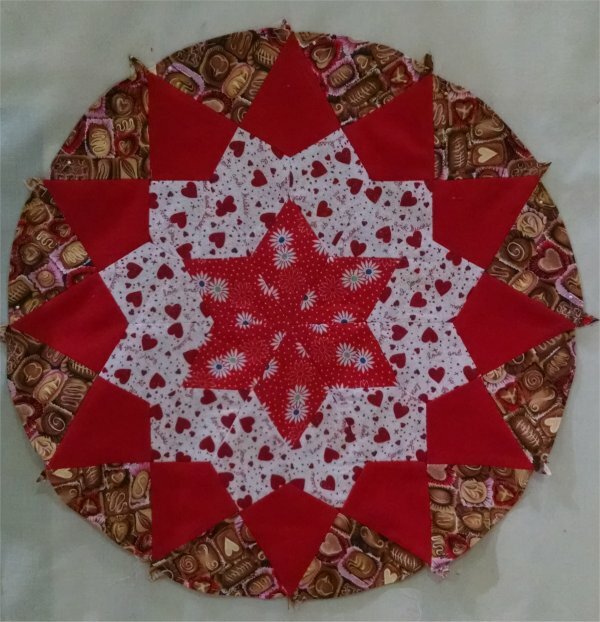 Right after I finished that half-star, I immediately plunged into my scrap bins and pulled out some fabric to make my first full star. It took me slightly more than a week ... as I missed last Wednesday's linky on Esther's blog ... but as of today (Saturday, 9/24/16), I *have* finished it! Woo hoo! This is just the circular star portion of the block. It finished at 19" diameter, which is less than the 21" dimension of the full block .. but that's because I have NOT determined what my background fabric will be. The background fabric will make up the difference. A "Forever Project™" is a handwork one, that I can do while I am away from home. When I'm home, I'm using my sewing machine. So, when I'm away from home .. appointments, road trips, whatever .. I want to still be productive and creative. I get antsy and feel as though I am wasting my time if my hands aren't busy with some sort of handwork. My Forever Projects™ sometimes really DO feel as though they are going to last "forever" but eventually they become completed. On the other hand, if it gets put aside and never gets done, that's OK with me also. After all, it *is* a "Forever Project™"! All the while, almost the only shape I did was hexies. Three years and many projects later, even I will admit that hexies are getting a little stale. Although, having said that, I have a zip pouch of fabric squares, hexie templates and supplies as my "grab bag" for working on something in the car .... hexies are absolutely mindless creativity for me these days. I have been thinking that it would be nice to work on OTHER shapes for EPP projects. So, it was rather fortuitous that I read Esther Aliu's blog of September 5, 2016 where she launched her newest pattern, "Stash Busting Stars". Eventually, I succumbed to it's siren call and purchased the pattern. Let me preface this next part by saying that I *DID* read the pattern before making the templates. Apparently, I glossed over the fact that a full star block is 21". Let me repeat that .. TWENTY-ONE INCHES square. It just didn't register ... at the time! From my stash, I pulled out a lovely piece of black background with hot pink polka dots. This would be *perfect* for the center star. But .. hmmm ... I only had enough to cut 3 star pieces (out of a total of 6 needed). Not to worry; I'm certain that more of the fabric is in my scrap box. Only, I don't. I up-ended my scrapbox and there was simply no scrap of this fabric in sight. And neither did this fabric exist in my yardage inventory. Oy vey! So .. hmmm ... what to do. Well, the pattern DOES call for a certain number of half-blocks and with only 3 star pieces that is exactly what I could make! Continuing onwards, I pulled out some compatible fabrics for the other block pieces and happily stitched away. Do you know ... really KNOW ... how BIG a 21" block is??? Good LORD .. it's HUGE!! (insert picture of my hitting my head on the wall). After working with the small hexies, these pieces felt incredibly awkward in my hands but I'm sure with repeated use, they will feel less so. The round star block is designed to be inset into a square block .. or alternatively, you could applique onto a background square. But, I am worlds away from making a decision on what the background fabric should be. So, what I did was to simply baste, with big, galloping stitches, the folded under edges of my half-star block onto a piece of muslin ... just to keep those pesky seam allowances in check!